Venue: London School of Public Relations – Jakarta, Prof. Dr. Djajusman Auditorium & Performance Hall – Campus B 3rd Floor, Sudirman Park. The event will be a seminar that discusses Authentic Singapore Food and Beverage Entrepreneurship which has gained success among ASEAN countries. The seminar will discuss the success of authentic Singapore Food and Beverage Entrepreneurship, the history and the marketing strategy that they use to expand their business. 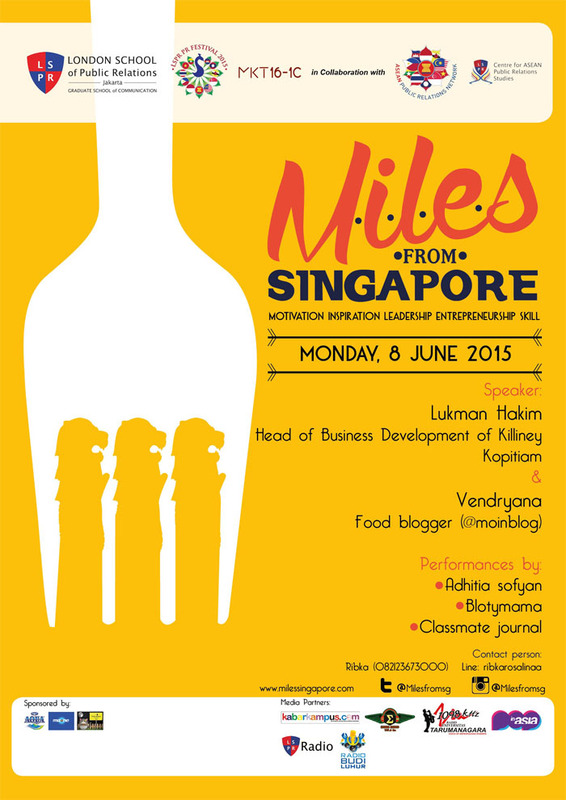 It will also give inspiration and motivation to be a creative entrepreneur in the food and beverage business. There will be two speakers at the seminar, Lukman Hakim as the Head of Business Development of Killiney Kopitiam and Vendryana (@moinblog) as Indonesian culinary experts. Aris Munandar as Indonesian Food Blogger will moderate the event. At last, Adithia Sofyan with Blotymama and Classmate Journal will perform at the closing of the event.